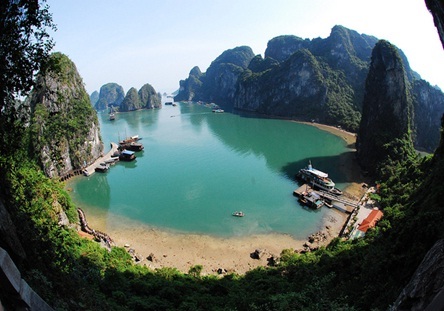 For those of you who have ever visited Halong Bay once, you cannot forget magnificence of nature in Halong Bay. Halong is famous for beautiful and unique caves. 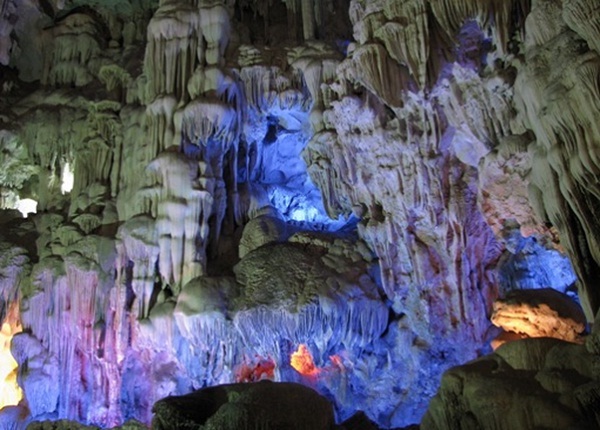 Each of caves in Halong Bay bears a name that reminds visitors’ curiosity to discover. In many caves in Halong Bay, Thien Cung, Kim Quy, Me Cung Cave are the most popular tourist spots here. The opening entrance to Thien Cung Cave is perched in the middle of the mountain which requires the visitors extra efforts in hiking up here. Once entering the cave, you will find yourself overwhelmed by the unreal beauty of the caves with flows of stalactites and stalagmites which really make your imagination work. On the wall of the eastern side of the cave, an impressive picture of stalactites and stalagmites give tourists the most fantastic feeling ever. The travel guide would never forget to tell you legends or folk tales interpreted from the picture by the local Halong people. Then you will follow the path to another section of Thien Cung Cave with huge opening to top of the mountain. In rainy season, this section is a bit wet with water dripping down from the ceiling. 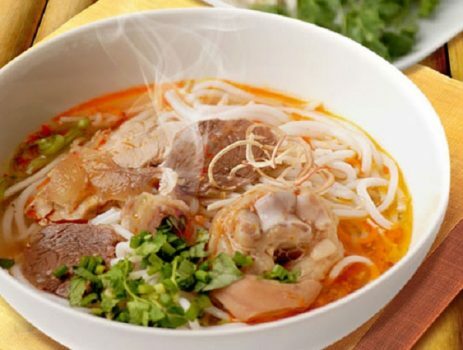 After that, you will move onto another section of Thien Cung Cave with amazing stalactites and stalactites which have various shapes ranging from a bald eagle to a lion, a dragon and figures in fairy tales, etc. 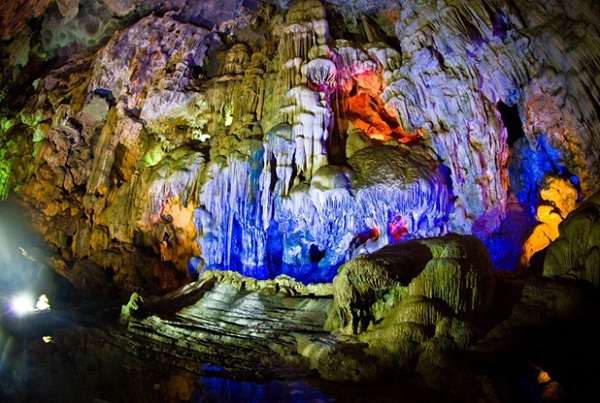 Kim Quy Cave is situated in Dam Nam Islet, about 12 kilometers far from Bai Chay Tourist Wharf. The cave also known as Golden Tortoise Cave, and it is a beautiful and interesting place stop for someone who wants to explore Halong Heritage. Kim Quy Cave is 100 meters long and stretches in a north-south direction, with a peak 187 meters above sea level. The cave’s width ranges from 5 to 10 meters. A narrow way leads to the interior of the cave where a stream flows. The stalactites here are snow-white and lightly hang from the ceiling. The natural beauty and interesting legend of Kim Quy cave make it a wonderful tourists place to stop when visiting Halong. Me Cung Cave is situated on Lom Bo Island, about 2 kilometers far from Ti Top Island to the southwest. The mouth of Me Cung Cave is on the height of 25 meters above the sea level. The space inside is divided into many small chambers. 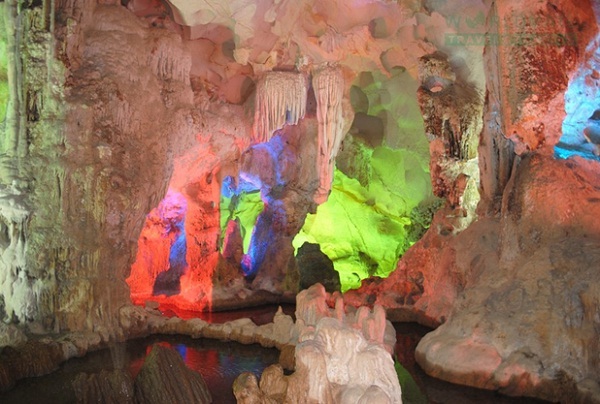 Passing the narrow entrance, visitors will enter a world of wonder with various stalagmites and stalactites in living forms of genies and wild animals. Sunshine from the outside makes the cave more mysterious. Threading your way through narrow passages, you find a dim light from afar, which signals the exit of the grotto. On getting out of the grotto, climb up several rugged stone stairs and look down, you see a large round lake surrounded by the mountain. Its waters are blue all year round. The lake is home to many kinds of fish, shrimps, octopuses, algae, see weed, and coral. Lying adjacent to the lake there is an area of old trees popularly known as an alluring “royal garden”. Pushing into the cave, tourists feel like walking in a palace of a Persian king. Hearing the murmur from out of nowhere, you think that Scheherazade is telling the stories of “Thousand and One Nights” for her king. Visiting caves in Halong Bay will create many wonderful and interesting experiences in discovering natural beauty of Halong.